The show kept us busy for the 3 days and with new products and services on offer. We were pleased to welcome both new and existing contacts and customers to our stand. The new Greenwood Semi-Automatic Grid Box was launched at the show. The demonstration model we had on display attracted a great deal of interest – including from our competitors! We have now secured registered design rights on this new product. 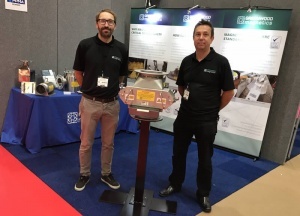 The show was a first for Greenwood Magnetics and we certainly look forward to having the opportunity to attend again in the future. In the meantime, for all your industrial magnet requirements, please get in touch.